This FAW 10 wheels Heavy Duty Dump Truck model is popular in Africa, South-east Asia and South America. The choice of the dump truck or according to specific purpose to choose the appropriate type, because of the dump truck general work environment are hard, choose the brand with quality and excellent public praise is particularly important that truck is earning good tools for good attendance. 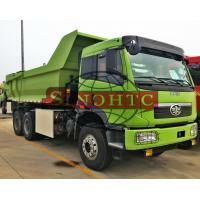 Specialist supply variou dump trucks, heavy duty dump truck. Our trucks have been widely used for construction site, mine area, sea port bulk transfer, earthmoving transport, garbage transfer station in the world. Competitive price, durable quality, comfortable driving experience,high safty, low consumption. Your best choice. (3) One year quality guarantee or within 30000km, which comes first. (4) The overseas engineers are always ready to deal with unexpected needs.